Jammu and Kashmir (J&K) is perhaps the only state where the democracy and constitutional provisions are blatantly violated. Though the state of J&K acceded to India in 1947 itself yet the democracy has remained away from this region because instead of democratic procedure the whims and fancies of Sheikh Abdullah and Pandit Jawahar Lal Nehru decided the destiny of the people living in this region. 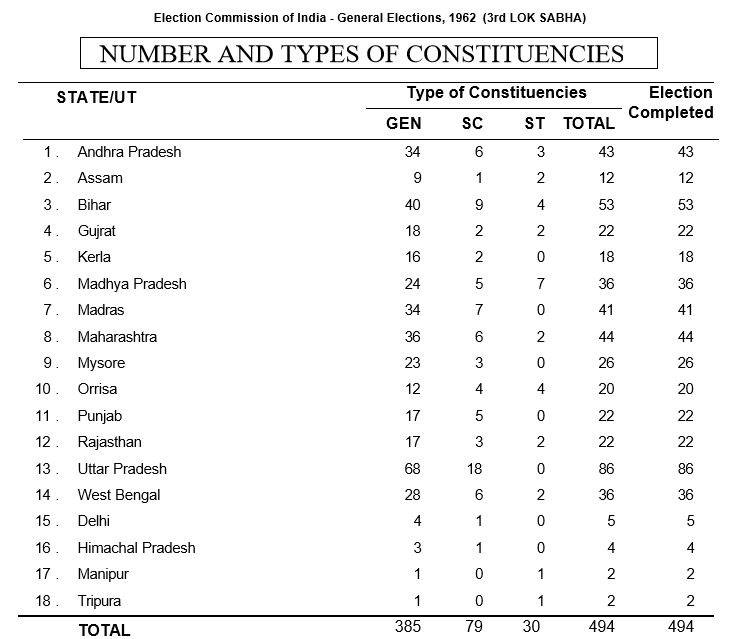 There are 6 Lok Sabha constituencies (parliamentary constituencies) in J&K. 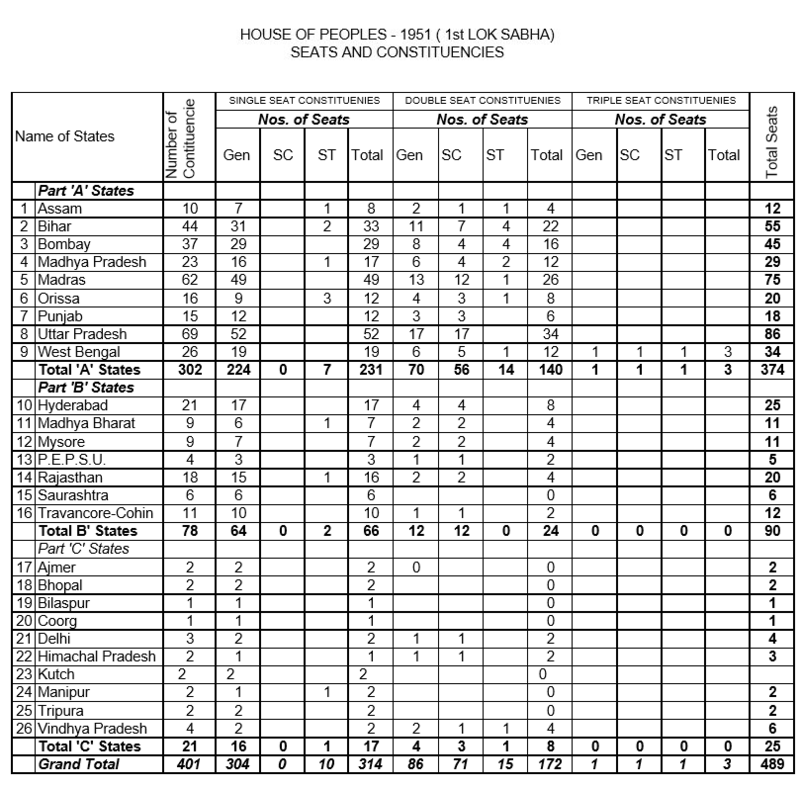 The elections for the Lower House of the Parliament (Lok Sabha) are held 12 times in the state of J&K whereas 16 Lok Sabha elections are held across India till date. Under Nehru government, people were not allowed to exercise their right to vote in first three Lok Sabha elections in J&K. There are a total number of 111 seats in state assembly but elections are held only on 87 seats, as the remaining seats are still under the illegal occupation of Pakistan. This area comprises of Gilgit-Baltistan and Mirpur and Muzzafarabad, which is collectively known as Pakistan Occupied Jammu and Kashmir (POJK). Though 1/3 of the total number of population of POJK migrated to the Indian administered areas of J&K yet the seats are not allocated to them. Ironically, legislative elections are held only 11 times in J&K. The grassroots democracy was missing to a very large extended, as municipal elections are held only 4 times in the state though it is the most cherished dream of the leaders of Indian National Congress. 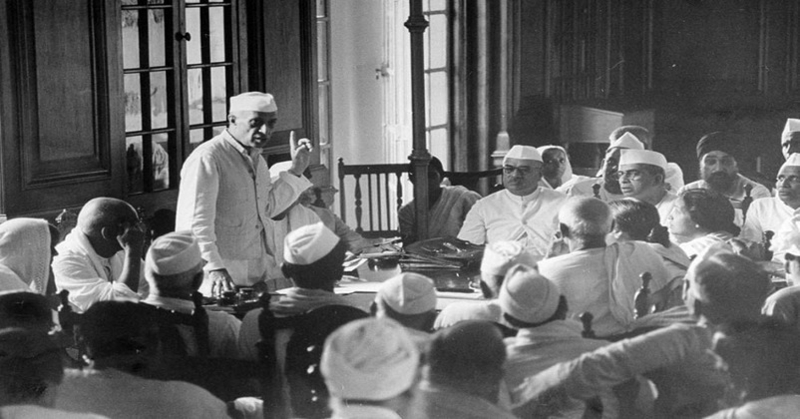 The first general election in India held from October 25, 1951 to February 21, 1952 since India attained independence. 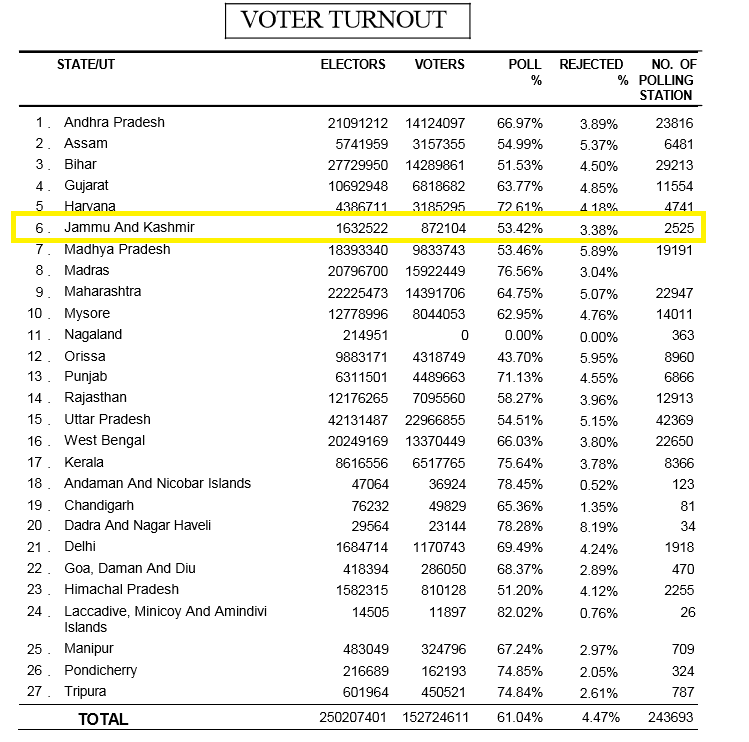 All the citizens above the age of 21 years could vote in this election and 85% of the population in India could not read or write at that point of time. Though the entire country was going for the election, where the population of the country would exercise its right to vote but the story in J&K was altogether different, where the members of Lok Sabha were not elected directly but the ruling class of J&K decided about it. Though the entire country has accepted the procedure of adult suffrage in the matter of Lok Sabha election but this procedure was lately implemented in J&K. It was only in 1967 when the elected members from J&K were sent to Lok Sabha. 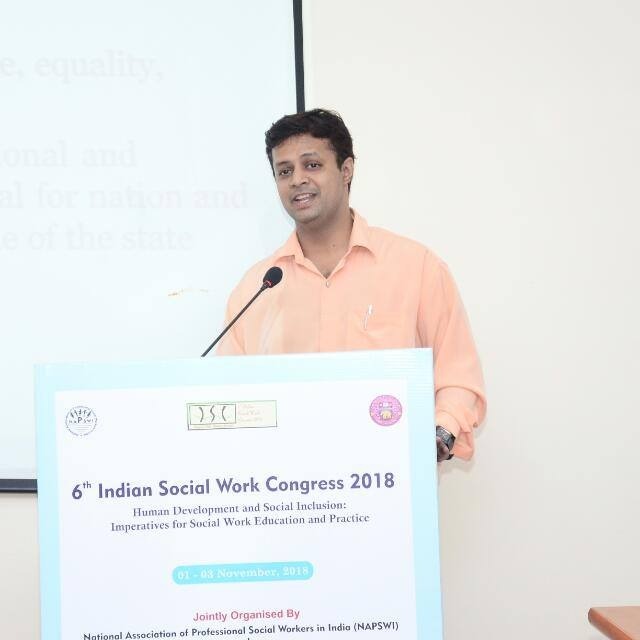 The entire state of Jammu and Kashmir was divided into 6 Lok Sabha seats but none of the seat was reserved for schedule castes and schedules tribes. No women candidate contested in this election and the polling percentage was 53.42%. Indian National Congress (INC) candidates won five seats whereas one seat was won by Jammu & Kashmir National Conference (JKNC). The INC candidates, who won the parliamentary election, and their respective parliamentary constituencies were: S.A. Agha from Baramulla, M.S. Qureshi from Anantnag, K. Bakula from Ladakh, G.S. Brigadier from Udhampur and I.J. Malhotra Jammu. JKNC candidate B.G. Mohamad won from Srinagar. The President of India issued the Constitution (Application of Jammu and Kashmir) Order 1954. This order was issued by using Article 370 (1) and several provisions of the Constitution of India were applied through it. One of the conspicuous amendments, with far reaching effects, was application of Article 81 of the Constitution of India with modification. 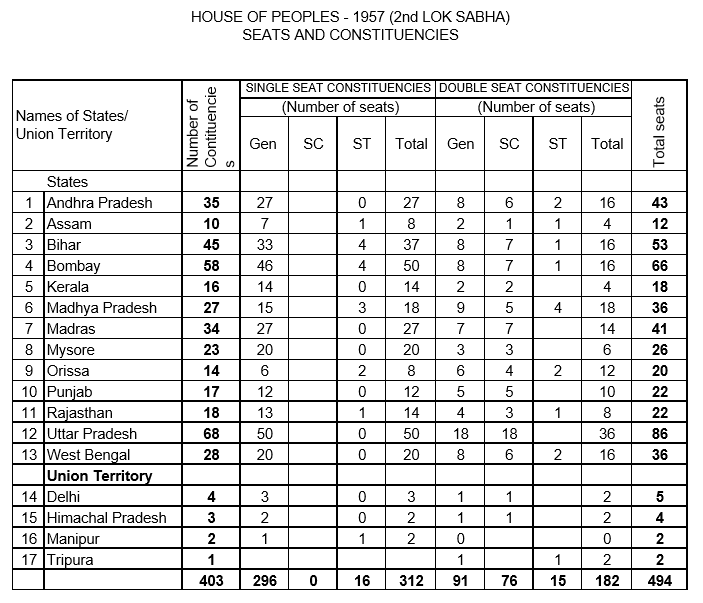 Six seats were allotted to the state of J&K in the House of People (Lok Sabha). Under Article 81, the entire country had adopted the practice of direct vote, where people exercise their vote to send their representatives to Lok Sabha. But in case of J&K the legislature were given the power to send their puppets in Lok Sabha as the method of indirect vote was adopted in case of this state. Hence, blurring the line between Lok Sabha and Rajya Sabha election and giving legal sanction to murder the democracy in the state of Jammu and Kashmir. President modified Article 81 under Article 370 (1) by Para. 5 (c) of the Constitution (Application of Jammu and Kashmir) Order 1954, to the effect that “the representatives of the State in the House of People shall be appointed by the President on the recommendations of the Legislature of the State”. Hence, Pandit Nehru was able to send his own puppets from J&K in Lok Sabha by strangulating democracy. 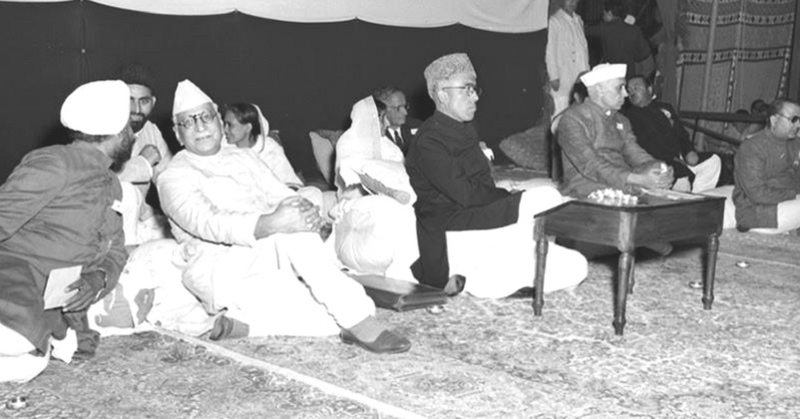 Nehru had already done enough damage to J&K under Abdulla's Influence. This constitutional order of Jammu and Kashmir was challenged in the Supreme Court of India in the case of Puranlal Lakhanpal Vs. The President of India and Others 1961 AIR 1519, 1962 SCR (1) 688. The petitioners challenged this order stating that the president of India has exceeded his authority by modifying direction election to the House of people clause to indirect election. He termed this amendment as radical alteration in Article 81. He said Article 370 (1) does not give permission for radical transformation. It is an unfortunate event that the Supreme Court of India erred in its judgment because it arrived at the conclusion that the President has wide ranging power to even subvert the democratic credential in India. It also abetted the violation of constitutional and democratic procedure that is being adopted by the country. It decreed that “the President had the power to make the modification which he did in Article 81 of the Constitution. The petition there fails and is hereby dismissed with costs. Petition dismissed”. Hence, with this clause the Supreme Court of India allowed to forgo with the established democratic procedures in J&K. The implication of the indirect election resulted that no distinction remained between Rajya Sabha (Upper House of Parliament) and Lok Sabha (Lower House of Parliament) elections. People were kept away from the democratic process and an ordinary citizen of this state cannot contest the Lok Sabha election in the state. And this murder of democracy was allowed with the active support of Pandit Jawaharlal Nehru. It was the violation of rights of the people and that violation was proactively abetted by Nehru, who was supposed to be the protector of democracy then. He was then Prime Minister of India but he did not perform his primary duty i.e. protection and promotion of democracy. He was talking about the reference to the people but he denied that reference to the people of Jammu and Kashmir during his entire life.